The first time I read Neal Stephenson's Anathem, a form of sci-fi, I felt like it was tearing my brain apart slightly. Anathem takes place on a world called Arbre, and Stephenson invented words for many things to denote the difference from our own history that were close enough to be familiar and prick at my neurons, but not identical. Fraa instead of Frere (for a brother in a monastery); concent (maybe for concentration) instead of convent; Saunt (short for savant) instead of Saint; and so on.I could feel my brain being rewired to learn some of the concepts in the book and recognize the language he was teaching me. 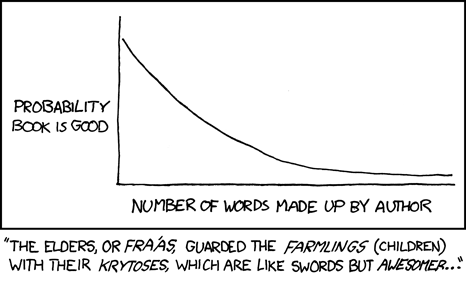 Randall Munroe's xkcd parodied Anathem, and perhaps rightly so. But it was clear that Stephenson was enjoying the freedom to screw around with words, languages, and frames of reference. Sometimes it gets tedious, but it's a good story with lots of science in the middle. Now, re-reading the book is a different experience. My brain has healed from the first pass a number of months ago, and diving back in is a pleasure. Strange concepts are ordinary, and now I can simply enjoy the story. And get some of the secondary meanings. In the concents, which are something like a combination of graduate school and monastery or convent, violations of the rules of the place--the Discipline--require that you work through chapters in the Book. But the Book, capitalized, isn't the Bible. Rather, it's a set of chapters of increasing difficulty which are full of randomness or logical fallacies. Penitents must copy out chapters and memorize the contents to answer questions. Early chapters are irritating, such as containing thousands of digits of pi, or tiresome, like rhymes that break. Later chapters represent complicated and flawed logic that will drive avouts (his word for those who live in the concents) slightly skewed or even insane. (They can also choose to leave the concent, which is a worse penalty.) In reading Stephenson's description of the Book, I realized that he was actually referring to his own book, in some ways. Given that he changed my brain a bit in order to read his book, that's certainly one aspect.